Launceston director of rugby Neil Bayliss says he is not worried about the club's position in National Two South at the moment. The club have won just twice all season and are fourth-from-bottom after losing their last three matches. "The league position at the moment, as it's so tight, it's not really affecting me," Bayliss told BBC Radio Cornwall ahead of their trip to Lydney. "At Christmas, we're still in the same position, then I'll start to worry." But Bayliss says he is sure their form will turn around, as they are playing some good rugby and have collected bonus points in four of their five defeats. 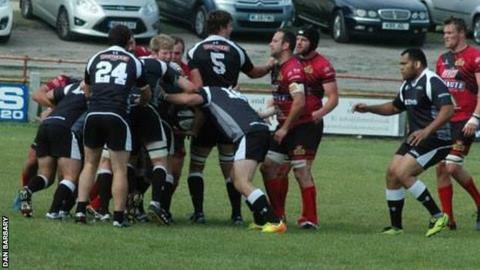 He added: "The results don't show it but we are playing such good rugby at the moment. "I'm particularly pleased with the effort and energy the boys are putting into training. "We just need to put it into an 80-minute performance and that's where we're falling down. "We've worked on it this week and we need to play for that full 80 minutes - and I'm sure the results will start coming."